"Mariano was a fierce competitor and a humble champion, which has made him such a beloved baseball legend. Success and stardom never changed Mariano, and his respect for the game, the Pinstripes and for his teammates and opponents alike makes this day such a celebration of his legacy. There will be many more great and talented relief pitchers, but there will never be another like him. This is another incredible achievement for Mariano, and a day like today brings me great pride knowing he wore the Pinstripes for each and every game of his remarkable career." "It's humbling to think of the incredible journey that Mariano has had over the course of his life - his unassuming beginnings in a Panamanian fishing village to pitching for the Yankees under the brightest lights with the world watching. I speak for every Yankees fan when I say how fortunate we were to have had him on our side for so long. Clearly his World Series rings and longtime statistical dominance testify to his standing among the greats to ever play our sport. But no matter how big a star he became, he never failed to carry himself with unerring professionalism and class. Mo was always someone who I could point to and say, 'That's what a Yankee should be like.'" 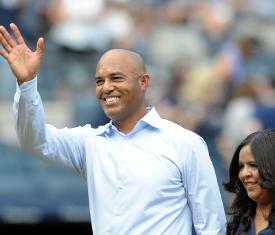 "Mariano was simply the best ever at closing out games. He had the perfect combination of confidence and humility, and it was a thrill to play alongside him." "Mariano is a rare, once-in-a-lifetime pitcher, and the greatest closer to ever play the game of baseball. There was such a humility and grace to the way he did his job - day after day and year after year. I'm so proud of everything he has accomplished, and I'm ecstatic that he and his family can celebrate this ultimate honor." "Mo, congrats on being a first ballot Hall of Famer. What an honor it was playing alongside of you for all those years. When I look back on my career, many of my best memories directly involve you. This is a pretty obvious statement, but I wouldn't want anyone else closing out a game that I started. I never took for granted what you provided for each and every starting pitcher in our rotation." "When it comes to Mariano, I had the best seat in the house from center field watching him pitch. It was mindboggling to see him literally just mow down hitters. Mariano would cause more broken bats in one inning than most starters had in an entire game. If we had a lead in the ninth inning - the game was over. He achieved a level of consistency for such a long time, and that is very hard to do. You just don't really see that in a reliever. That's what made him so remarkable. Everyone in the stadium knew he was going to throw that cutter - and they still couldn't hit it. "Mariano, in almost two decades of pitching, essentially dominated three generations of players of the mid 1990s, through the 2000s and into this decade and he did it with just one pitch. He faced everyone from Cal Ripken Jr. and Ken Griffey, Jr. to Ichiro, David Ortiz and Miguel Cabrera, to Mike Trout and Manny Machado. "A lot of people don't know this, but in the clubhouse, Mariano was a prankster - he was very funny and would play jokes on guys and keep things loose. He was also one of those old school players that took it upon himself to take care of young players. He would take rookies to dinner, talk to them about life as a major leaguer and how to carry yourself. He was always very embracing of the young blood on the team - a great teammate. "He was also a family man who was very devoted to his wife and kids. Perhaps the one thing I admired most about him is that on his long road to becoming the greatest reliever of all time, he included his family, and took this journey with them close by him the entire time. That's just the kind of man he is. "There was, and always will be just one Mariano - a special player, special teammate, special man." "Mo was the only closer in baseball that jogged onto the field and everyone knew the game was over - including the opponent. He was such a class act. He never showed up a batter after striking someone out or retiring the final batter of the game. It was such a joy being a teammate of his." "He is absolutely the best. I have said it many times - we would never have had the run in the '90s without Mo! I don't know many people I respect more than Mariano, because of who he is and how he stayed who he was, even while being the best ever." "When I think about Mariano, I don't think about the devastating cutter or the pinpoint control. I think about the man! As dominant as he was on the mound, he was as equally humble off of it. Obviously a Hall of Fame pitcher but, more importantly, a Hall of Fame man!" "I was fortunate enough to be there from the beginning, when he came sporting a nasty changeup as a starter. I watched the transformation from shy setup man to ultra-confident, unflappable closer. And through it all, his grace and class was more overpowering than his pitches. And that is saying something. It was one of the joys of my professional career to be there from the start to the finish of a remarkable career. He's always been a Hall of Fame man. Now he's a Hall of Fame pitcher." "One vivid memory - the Yankees had just lost Game 5 of the 1995 Division Series. Everyone was crying. Mariano was standing outside the Yankees dugout, just staring at the field. I said, 'Come on, Mo, let's go home.' He walked across the field with me to the bus and said, 'This hurts so bad…I don't ever want to feel this way again!' And he pretty much never did. Congratulations to the best of all time, who happens to be an even better man." "Mo is one of the greatest pitchers of all time, and he is the greatest closer of all time. It was always a challenge to face him, but I enjoyed the competition, and I like to think he did, too. It is very special for me to be able to share this day and this honor with him. Especially since, not only was he a great pitcher, but he did terrific work in his communities." "Congratulations, Mariano. Throughout your career, you exemplified the meaning of the phrase 'Hall of Famer.' You are one of the most amazing pitchers in baseball history and have always represented the game with great class and dignity. Enjoy your rightful place in Cooperstown."